As a beekeeper it drives me nuts that companies make a lot of money selling chemicals that kill clover in lawns. As if clover is some kind of weed. Where does the demand for these herbicides come from? I like to think it can be blamed on clever marketing. 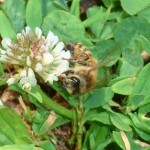 To a beekeeper clover is valuable forage. I celebrate the clover in my lawn (the dandelions too.) I enjoy watching the bees working flowers and going about their business. 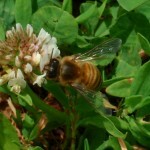 To that end, I want to share some pictures of honey bees foraging on white clover. 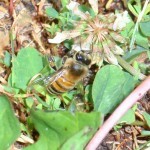 Honey bee foraging on clover. Honey bee gathering nectar and pollen. 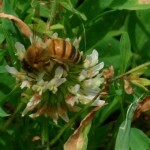 Clover is beautiful to honey bees and beekeepers.